A few caveats about the Coen Brothers before I write about Inside Llewyen Davis. When I used to teach Film Studies at the University of Calgary, there were two courses that I particularly excelled at: one was my survey of the Coen Brothers, which I taught three times, and which is the closest I’ve come to a class with mythical status (students used to bring their friends to class because “Oh, man, we love Fargo!”). The other was a course on The Big Lebowski, where students would watch that film every week of the term and we’d talk about it every week. I only taught that twice, but at the end of the term the second time the students threw a party and brought all their friends to watch Lebowski together a final time. It was like something out of Community. What I mean by telling you this is that I have never seen a Coens film that I didn’t like. I’m the guy who thinks Ladykillers is underrated and that Intolerable Cruelty was one of the best films of that year. I can’t do those lists where you rank the Coens films relative to each other because I tend to give them all A+. The combination of the Coens plus Greenwich Village folk scene for Inside Llewyen Davis is, as my friend Donna noted, “quite the collision of overlapping interests” for me. Between work, the holidays, and an eight year old son, I couldn’t get to Inside Llewyn Davis before last night. I went in expecting it to be the greatest thing ever, and I was not disappointed. I loved every single frame of this film. I wished I could pause it and walk around in it, and look at the copies of Sing Out! on the walls to see which precise ones they were. I wanted to loll in the Gorfein’s apartment and read their books. I wanted to ride in that car. I wanted Llewyn so badly to take that cat. Watching Inside Llewyn Davis is a lot like reading the first and last chapters of Dylan’s Chronicles. Dylan didn’t have an apartment in New York the first year that he lived there – like Llewyn he couch-surfed, often staying with wealthy patrons like the Gorfeins. Dylan’s full-throated endorsement of serious literature, history and philosophy in that book (and elsewhere) is one of the more convincing arguments I’ve ever read for the canon (essentially: reading the great works of western literature made me the singer I am, you should do it too), and watching Davis pass up those opportunities is the first signal that he’s not going to become Dylan by the end of this film, just as Llewyn visiting his father in the film recalls Dylan’s visits to Guthrie – but Hugh Davis and Woody Guthrie are very different father figures and influences. Everything about the film is incredibly well done. The performances are great. The cinematography, which captures that slushy Freewheelin’ Bob Dylan album cover aesthetic so perfectly, is wonderful. The set design and costumes are spot on. At one point Llewyn walks past Kettle of Fish, the bar beside The Gaslight. He never goes in, but just the attention to detail to bother to put that there is remarkable. The film uses Dylan, of course, as a counterpoint to Llewyn, as it would have to. Another of the Coens retellings of The Odyssey – the only real question in the film is whether the cat will be revealed as Ulysses or Odysseus – complete with a gate of polished horn, through which one can pass to make your dreams come true, the film develops its travel motifs to the fullest. When Dylan arrives he performs “Farewell”, a song that he recorded on The Witmark Demos in late 1962. It’s one of the many anachronisms that dot the film (the poster for The Incredible Journey is two years too early; The Gaslight didn’t serve alcohol; Dylan didn’t play The Gaslight in early-1961 – indeed, in Chronicles he writes about how difficult it was and how important it was to him to crack that club), but, as with most of the Coens films, it is the anachronisms that give the film its logic (The Incredible Journey poster is maybe the best moment in the entire film). The choice of a Dylan song that is too late for the scene is not an error, of course, it’s just another part of the Dylan myth. If Dylan can lie to Cynthia Gooding about working the carnivals for six years, why can’t the Coens fudge the truth on the time of authorship for one of his songs? Especially when it is in the service of a greater truth? Llewyn’s true love is the scene that is about to be shaken to its core by the arrival of Dylan, and his pitiable “Au revoir” is the gesture of a defeated man. The Coens build their portrait of the failed artist so economically – how little we know about Llewyn’s former partner Mike, but how clear they make what happened – that we know everything we need to about Llewyn after spending a week with him. It’s a heartbreaking film – more sentimental filmmakers would have milked that final shot for tears – and a convincing portrait of the artist in search of his muse. Dylan left quite a large collection of recordings in 1961, even before he signed with Columbia. His biography indicates that he left university in Minneapolis in December 1960, and arrived in New York shortly after, but that he didn’t make his way down to Greenwich Village until February 1961 (something that he says onstage at Carnegie Hall later in the year). Robert Shelton’s biography, No Direction Home, is quite interesting about this period (Shelton was there, writing for the New York Times about the folk scene), and particularly good on the subject of Dave Van Ronk and Jack Elliott as influences and mentors who helped broaden Dylan’s influences. The Gleason Tape, recorded in Februrary 1961, is a remarkable document. Dylan was only nineteen years old at the time, and he sings a collection of folk standards, but even more Woody Guthrie songs. Obviously, Dylan’s debt to Guthrie is enormous, but the extent of it here is really striking. The Beecher Tape, from a trip back to Minnesota and Wisconsin in May, is better, but is similar. Dylan worked the coffee houses and at Gerdes Folk City in the interim, and his craft shows a great deal of improvement. His repertoire is expanded and the performances are generally stronger, but there is still a ton of Guthrie here, including Car Car, which is a fun song to play but makes me cringe whenever I have to listen to it. More than half of the Beecher tape is Guthrie covers. Robert Shelton writes: “The latter half of 1961 changed Dylan from a provincial folknik into a music professional”. This seems clear from the recordings. I have scattered songs from the WRVR Hootenanny Special and from the Gaslight Cafe, and almost everything from the second half of the year is stronger than from the first. Having only recently turned twenty, the speed with which he was professionalizing himself was remarkable. By the time he recorded “The First McKenzie Tape” in November, he’d played Carnegie (Chapter) Hall and signed to Columbia – he has begun segueing into the performer that will release his first album, and he plays a lot of the same material. That’s for next week, though. When I think about where I was when I was that age, and the skill set that was required for him to write a song like that, well, I can’t relate! The two bootlegs I have from 1960 vary considerably in quality. The first is excerpts from the Karen Wallace tape, recorded in May 1960. This is slow-going as so much of the material is chopped up. Apparently there is a ninety minute tape out there in the world, but that’s not what I heard. There’s a big distinction between this material and the recordings from 1958, when Dylan was in high school. Here he is playing traditional folk music. He doesn’t sound like a soon-to-be star (at least from what I can tell) but the level of improvement is clearly noticeable. The better tape is the “Minnesota Party Tape” (not to be confused with the “Minnesota Hotel Tape” from 1961). 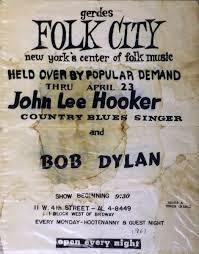 The sound quality is far superior (though still not great), and so is Dylan’s performance just four months later. Again, a lot of traditional music and Woody Guthrie covers, but you can distinctly hear Dylan becoming Dylan at this early stage. His voice has a strong touch of the Nashville Skyline ring to it, although you can clearly hear the rasp, particularly on the Guthie covers “Talking Columbia” and “Talking Sailor”. To me the most interesting parts of the Minnesota Party Tape are the four talking blues song at the end. I remember being fascinated by Pete Seeger’s version of “Talking Union” when I was a teenager and got a copy of his Greatest Hits album. At the time (mid-1980s) rap and hip hop were first becoming popular on top forty radio, and the link between the talking blues, the more political version of it derived from Guthrie, and rap seemed pretty clear to me. I now learn that the talking blues stems from the comedy country songs of Chris Bouchillon, and that it was adapted by Guthrie (who was erroneously credited with developing it by Seeger and others). 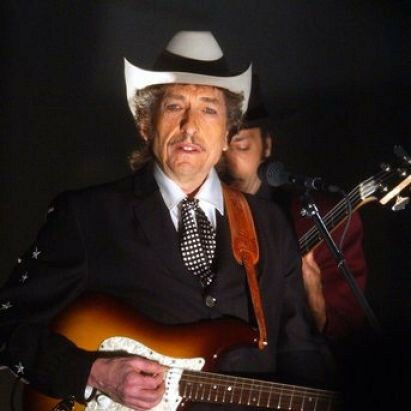 Dylan is reportedly influenced by the album “Talking Blues” that Folkways released in 1958, and two of the songs on Minnesota Party Tape can be found on that release.